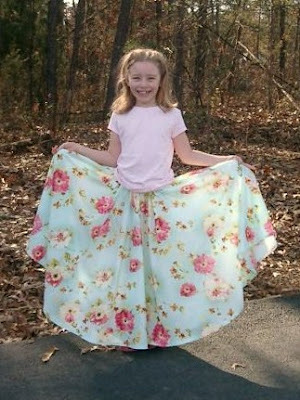 Cottage on Fox Hollow: The Twirly Skirt is here! 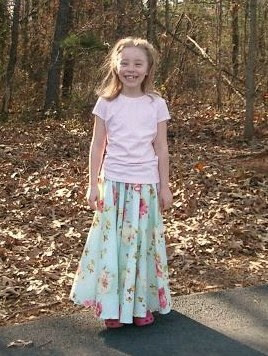 Here is the twirly skirt I made yesterday for Brenna. She's been asking for one, and when I saw this camelia fabric, I knew it was the one. She's very happy with it, even though I believe it's a tad too long. I did, however, make it with the hopes that she'll be able to wear it for years as long as I switch out the elastic waistband. 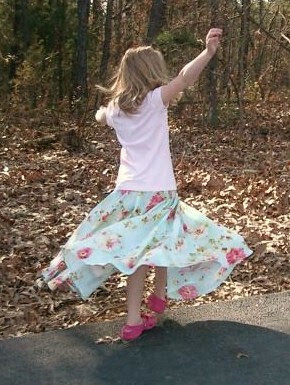 And so she commences to twirling. This was actually a picture I snapped as she was catching herself from falling. If you ask me, I say it looks like a table cloth, but I'm so happy I actually finished it. Now she wants a matching skirt for some of her dolls/stuffed animals. Childhood is so sweet and carefree. What a life. On to the next project. . .
Oh, my gosh! Her skirt is b-e-a-u-t-i-f-u-l!!!!!! I adore it!!!! As is her quilt!!!! You are sooooooooo talented! I wish I had the words to tell you how beautiful that quilt and skirt are!